I receive free products and participate in affiliate programs where I may receive a commission, at no cost to you, if you visit a merchant’s site and make a purchase using links from within this page. The mattress-in-a-box industry has simplified the often dreaded task of mattress shopping by reducing the number of choices that consumers have to make while allowing them to avoid high-pressure salesmen. But has the process of mattress shopping become overly-simplified? Nearly all mattress-in-a-box companies are offering one mattress with one level of firmness, which is typically a “medium”. The logic is that since the majority of people prefer a medium mattress, most customers will be satisfied with this one-size-fits-most approach. Why do so many online mattress companies offer only one firmness option? The primary reason has to do with the cost associated with storing inventory. When a mattress company offers a choice of 3 levels of firmness, this means that they must produce and warehouse 6 different size mattresses in 3 different firmness levels or a total of 18 different mattresses! While offering only one firmness option helps out with manufacturer’s carrying cost, it does nothing to personalize the mattress to an individual’s needs. Muse, on the other hand, is one of the only foam mattress companies that will allow you to choose your firmness level. To keep things simple, they created a tool which helps you to determine which level is right for you by answering a few simple questions. Other features that make this mattress unique is a cooling foam and phase-changing mattress cover that’s both removable and washable. While Muse answers several questions on their website, there are still a lot of questions that you may have. Is this mattress really comfortable? How cool does it sleep? Does it provide good support? How well does it isolate motion? Does it smell? I recently had the opportunity to test the Muse and hope to help you answer these questions and many others. 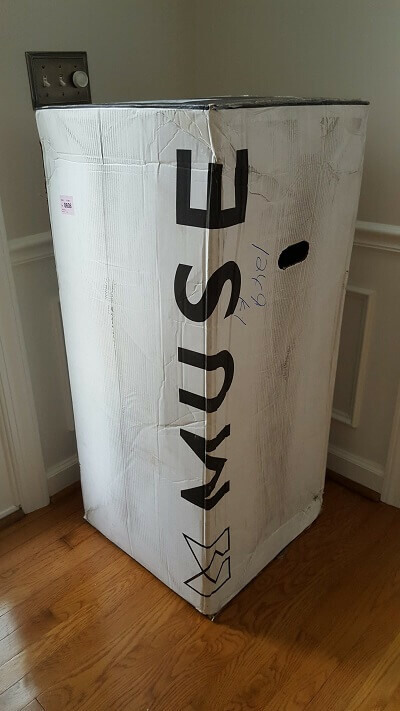 My queen size soft Muse mattress shipped from Auburn, Indiana via FedEx ground and took two days to arrive. The shipping speed was a bit faster than the 5-7 days that was advertised on their website. Keep in mind that your ship time will vary depending upon proximity to their warehouse. The package measured 43″ X 20″ X 19″ and weighed approximately 95 lbs, so moving it upstairs into our bedroom was a two-person job, as the package is a bit large and somewhat heavy for one person to carry. My wife and I found that it was much easier to carry the mattress after it was removed from the box. Once upstairs and positioned on our wood slat bed frame, I was able to set the mattress up by myself. The setup process was similar to all other press and roll mattresses that come in a box. The box contained a small package with a plastic opening device along with an instructional booklet. I began by finding the end of the shrink wrap film, unwrapped it and then laid the mattress out with the cold wire fabric facing up. From there, I pierced and glided through the plastic cover to remove it. The mattress instantly decompressed and began to take shape. Within a couple minutes, it had fully expanded. The Muse website suggests waiting 1-2 hours before use, but I waited until the next night before putting it to the test. The overall setup process was very simple and took about 10 minutes from doorstep to completion. Some foam mattresses give off a smell when opened. 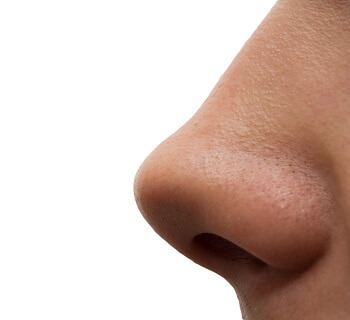 This smell is caused by off-gassing which is the release of volatile organic compounds (VOCs) into the air. If strong enough, VOCs can irritate the airway, cause headaches, and even nausea. Off-gassing occurs with almost all manufactured products and usually becomes less noticeable over time. Everything from new furniture to new shoe will off-gas to some degree. While it’s impossible to find a mattress that does not produce VOCs, a good place to start is by choosing a mattress that’s CertiPUR-US certified, which the Muse mattress is. The smell of VOCs is most prevalent when a compressed mattress is first opened. The reason being is that most foam mattresses are produced and then immediately packaged up which does not allow time for the material to breathe. After unpacking the Muse, I gave it the smell test which simply involves burying my face into the mattress. Surprisingly, the mattress did not give off any sort of smell. It’s not uncommon for a boxed mattress to off-gas for at least a couple days. With the Muse, off-gassing was not at all an issue. Foam mattresses are not exactly known for having great heat dissipating qualities. In fact, foam mattresses have gotten a bad reputation for trapping heat which causes hot sleeping. This reputation is quickly disappearing thanks to advancements in foam manufacturing technology. Today, several foam mattress makers are using foam that’s infused with gel beads which helps with the regulation of body temperature. 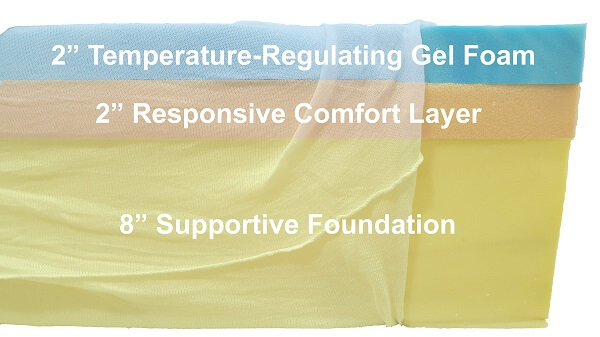 While Muse incorporated a 2″ slab of temperature-regulating gel foam into the top of their mattress, they take it one step further by covering the mattress in a unique cold wire fabric. The mattress cover is made from cold wire yarn which creates a phase-changing fabric that is cool to the touch and helps to regulate body temperature. Some manufacturers use chemicals to treat their mattress covers in order to help with heat dissipation. Instead of using chemicals, Muse went with a cold wire yarn to create a polyethylene fabric that offers a similar cooling effect but without the chemicals. When laying down on the Muse, I found that it does, in fact, have a soft, silky feel that’s cool to the touch. Muse does offer a free swatch of their cool-to-the-touch cold wire yarn fabric. You can request one by visiting their website and clicking on “Request a Swatch” at the bottom. When sleeping on this mattress, it remained cool throughout the night. I, however, was interested to know exactly how well this mattress dissipates heat. In order to find out, I conducted a heat dissipation test to give you a more quantifiable answer. In this test, I heated up a large rice bag in the microwave for two minutes and then placed it on top of the Muse where it rested for a total of 10 minutes. This brought the mattress up to around 107 degrees Fahrenheit. I set up an infrared temperature gun with a stopwatch attached to measure temperature drop. I removed the rice bag and started the stopwatch. After 2 minutes I calculated the total heat loss which came out to 20.7 degrees. The chart below shows the rate at which the Muse mattress dissipated heat. 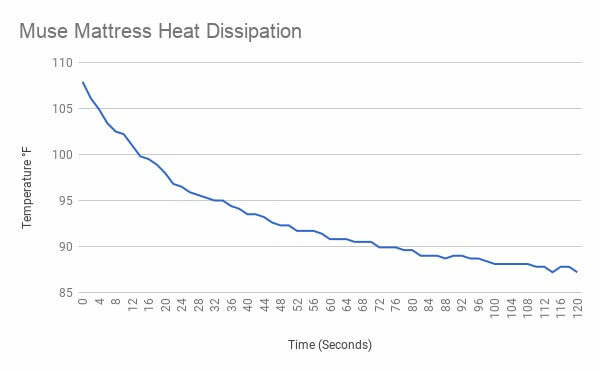 This mattress lost a lot of heat within the first 30 seconds – 12.6 degrees to be exact. This is an indication that the Muse does not hold heat very well, which is a good thing if you are a hot sleeper. The firmness of a mattress refers to how soft or hard the mattress feels. Does the mattress feel plush like a cloud or hard as a rock? Some mattress makers will rate the firmness of their mattress on a scale from 1 to 10 with 1 being the softest and 10 being the most firm. For this review, I’m testing out the “soft” which is said to be a 5 on the firmness scale. In order to compare the softness of this mattress to other foam mattresses that I’ve tried in the past, I conducted a sinkage test which is somewhat similar to an ILD test. This simple test involves placing a concrete-filled bucket weighing 42 lbs on the surface of the mattress. The bucket has a ruler attached to the side which will be used to measure the indentation. A straightedge is placed across the bed and a reading is taken where the straightedge meets the ruler. In this test, I measured a drop of 2.5″ which seems within range for a soft mattress. After giving the mattress a feel and conducting the sinkage test, I personally would rate the soft mattress at around a 4. This mattress is very plush and has a nice soft feel that would work well for a side or even a back sleeper. While you may assume that a soft mattress does not provide any support, this is not necessarily true. The top layer is most important when it comes to firmness and comfort. The base layer, however, is most important when it comes to body support. A dense, high ILD foam at the base can mean the difference between a mattress that offers proper support and one that misaligns your body and leaves you feeling sore in the morning. How well a mattress supports your body depends on factors such as your size, weight, and sleeping position. The best way to determine if a mattress provides proper support is to lay on it and have another person observe the alignment of your spine. If your body folds into a V shape when laying down, the mattress does not provide enough support. I’m 6’1″ and 215 and felt as if this mattress worked well to support my body as I slept. My wife watched as I laid down in both the side and back sleeping positions. She noted that my sleeping posture was good. Keep in mind that your results may vary depending on your body type. If you are larger in size, it may be a good idea to choose the medium or firm Muse as either will be a bit firmer and may offer more support. Once compressed, it takes time for foam to bounce back. The amount of time that a mattress takes to return to its original shape is referred to as recovery time. This could take anywhere from a few milliseconds to several seconds. While slower responding memory foams are useful in some applications, mattresses do not happen to be one of them. Most people prefer a mattress that responds quickly and doesn’t leave you feeling trapped and unable to move. Slow responding foam can leave you feeling stuck inside of the mattress. This can be especially disruptive for more active sleepers who frequently toss and turn throughout the night. Although the Muse mattress is very soft and comfortable, I found that it was easy to maneuver around on it. The bed definitely didn’t give me a feeling of being “stuck”. When I pushed down on the mattress, it responded very quickly although the top layer had a response time that was a bit slower than the bottom two layers. You can see how quickly this mattress responds in the video above. Choosing a bed with good motion isolation is essential if you plan on sleeping with a partner. It only takes a small amount of movement by your partner to disrupt your sleep which can leave you feeling tired throughout the day. Motion isolation refers to how well a mattress prevents the transfer of motion. In other words, will you feel the mattress move when your partner rolls over or gets up in the middle of the night? Some mattresses are more effective than others when it comes to motion isolation. Innerspring mattresses provide the least amount of protection against motion transfer while foam mattresses generally do very well with motion isolation. While I have no complaints concerning motion transfer with the Muse, I did perform a test to demonstrate how this mattress handles motion. In this test, I placed a wine glass that was half filled with water on one side of the mattress. 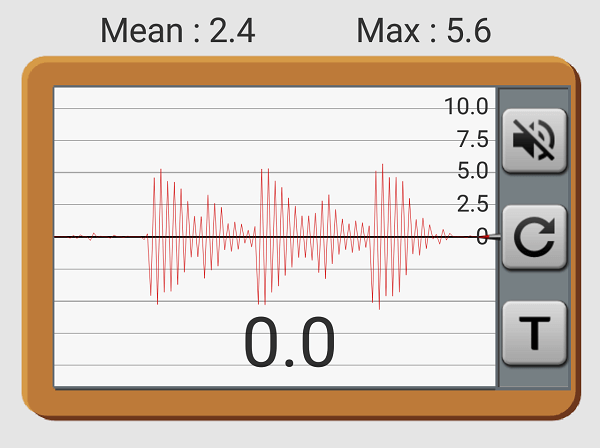 I also used a vibration app to measure the amount of movement that occurred in the same area. On the opposite side of the bed, I dropped a 14 lb weight from a distance of 12″ in order to simulate a partner moving on the bed. The weight was dropped three times as I recorded the movement of the glass, which can be seen in the video above. The vibration meter results showed a max reading of 5.6 MMI and a mean reading of 2.4 MMI. As you can see, the Muse Mattress performed very well in the motion isolation test. This was expected as it is an all foam mattress. When laying near the edge of the bed, do you feel as if you may roll off the edge? How well does it support your bottom when sitting on the edge? The edge support of a mattress matters and can make a difference when it comes to using the entire surface area of the mattress. Foam mattresses are generally inferior when it comes to edge support. How well a mattress holds up towards the edge will depend greatly on the type and density of foam that is used. I noticed that while sitting on the Muse mattress, it doesn’t offer very much edge support and will sink down. However, when laying close to the edge of the mattress, where my weight was more evenly distributed, I did not experience the feeling of being ejected from the bed. I was able to lay close to the edge of the bed without any issues. While this may not be the best mattress for sitting on to tie your shoes, you shouldn’t experience any issues when laying close to the edge. 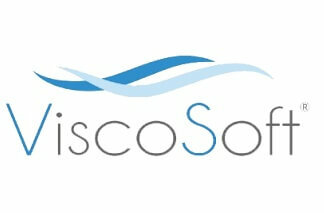 ViscoSoft is the parent company behind the Muse mattress. The company was formed in 2007 and began by selling sheets, pillows, mattress protectors and mattress toppers before expanding into the mattress-in-a-box industry in 2016. ViscoSoft is based in Charlotte, NC and was founded by three gentlemen – Gabriel Dungan, Rick Wo, and Matthieu Witkowski. The trio operate a global business with the goal to deliver quality sleep products around the world. They currently have offices in the US, China, and France. Gabriel Dungan is the president and founder of ViscoSoft. He began his career by working in international trade in Hong Kong before moving to France but eventually made his way back home to North Carolina to form ViscoSoft. Aside from the Muse mattress, Dungan and his team are currently working on a smart mattress project which they call “Matrix”. The mattress is the first to track sleep cycles, breathing, heart rate and movement. The Muse mattress boasts an incredible 12″ thick profile, which is 2″ thicker than most foam mattresses that are out there. Like most foam mattresses, this one features three layers of foam, each with its own unique purpose. First, let’s talk about foam density which you will often hear manufacturers refer to when talking about their mattress. Foam density is measured in pounds per cubic foot. This is simply the weight of one cubic ft of a particular foam. In general, higher density foams are heavier while lower density foams are lighter. Starting at the bottom, the Muse features an 8″ thick slab of 2lb VPF foam which is used as a base layer for the middle and top layer to rest on top. This layer provides support and prevents your body from sinking too far into the mattress. The middle layer of foam will vary in density depending on which mattress that you choose. For instance, if you go with the medium firmness mattress, the middle layer may have a density of 4lbs while a softer mattress will contain a lower density foam at the middle and a firmer mattress will contain a higher density of foam. The top layer of foam is 2″ in thickness and features temperature-regulating gel foam with a density of 3.5lbs. Since memory foam has a tendency to retain heat, Muse infuses this layer of foam with gel beads which help to transfer heat away from the mattress to keep your body cool. To top things off, this mattress is covered with a cold wire cover. This cover is made from cold wire yarn which is used to create a phase changing material to help keep your body cool throughout the night. It can be unzipped, removed and laundered. All three firmness mattresses are identical in construction with the exception of the middle layer which is swapped out depending on which firmness option you choose. Muse is made in the United States in Auburn, Indiana from foam that is CeritPUR-US certified. You may have heard the term “CertiPur Certified” but what exactly does this mean? 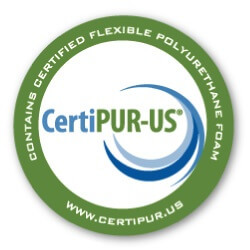 In 2008, the CertiPur-US certification program was created in response to foams that were entering the United States and contained potentially harmful chemicals. This certification program is administered by a not-for-profit organization who test foams for compliance. Volatile Organic Compounds, which must test at less than 0.5 PPM. In order to display the CertiPur-US badge, the foams used to produce the mattress must fall within the strict guidelines which are set by the organization. Taking a quick look at the Certipur website, it shows the Muse Sleep as being a participating company. One unique feature that Muse is proud of is the fact that you can order one in the firmness level that you desire. This option is uncommon in the boxed mattress industry. Muse offers three different comfort levels including a soft, medium and a frim. On a scale of 1-10, they show the soft as being a 5, the medium is a 6.5 and the firm is an 8. If you are unsure of which firmness to choose, Muse has you covered. To help make this decision easier, they created a 6 step sleep personality quiz which asks you a series of questions about your body type, sleeping position, bed sharing, sleeping temperature, etc. An algorithm is then used to help you determined exactly which mattress is a good fit for you. It takes less than a minute and you will know exactly which mattress to choose. Another nice feature that the Muse has to offer is the fact that you are able to remove and wash the mattress cover. Simply unzip the cover and wash it in cold water using the gentle cycle. Be sure to tumble dry on low. Do not iron or dry clean. Muse suggests using an enzyme-based cleaner to spot clean the foam or cover. To deodorize, you can also sprinkle baking soda on the area and allow it to sit before vacuuming. Persistent stains and odors should be removed by a professional who specializes in cleaning mattresses. In order to avoid staining the mattress, a mattress protector should be used which Muse also sells. To ensure even wear, be sure to rotate the mattress 180 degrees every six months. The Muse mattress is not designed to be flipped over. Muse offers a 10-year limited warranty that is similar to other manufacturers’ warranties. This warranty covers items such as unraveling of stitching due to manufacturing defect and sags that are greater than 3/4″. Interestingly enough, their warranty covers indentations greater than 3/4″. Most mattress manufacturers set this threshold for normal sagging to greater than 1.5″. Setting the limit so low is an indication that they are likely using foam that durable and will not easily compress and wear out prematurely. With the exception of a lower sagging limit, there’s nothing unusual or exceptional about this warranty. The price of the Muse is the same, regardless of which comfort level you choose. There is, however, a variation in price based on the size that you choose. Thier mattresses start at $650 for the twin and go up to $1,100 for the California King. They do offer free shipping on all orders. Compared to other foam mattresses that are available, this one is average in price. Most mattresses these days come with some sort of trial period where you are able to test it out and may return it free of charge if you are not satisfied. A trial period is essential when it comes to buying a mattress online because you do not have the opportunity to get a feel for it prior to purchasing it. Nearly all online retailers realize this and therefore offer a trial period. While some retailers offer a trial period of only 30 days, there are others who will accept returns up to a year later. Muse offers a 120-night trial period which is more than generous. Most people will be able to determine if the mattress is a good fit within the first few weeks of sleeping on it. If you decide that the Muse is not a good fit, you can request a refund. Instead of stuffing the mattress back in the box (which is impossible) they will ask you to donate it to a local charity and then will issue a refund. They do however ask that you sleep on the Muse for 1-2 weeks in order to get a feel for it and break it in. If you are considering a mattress-in-a-box, there are literally dozens of products to choose from. Unfortunately, many of these mattresses are nearly identical when it comes to construction and features. 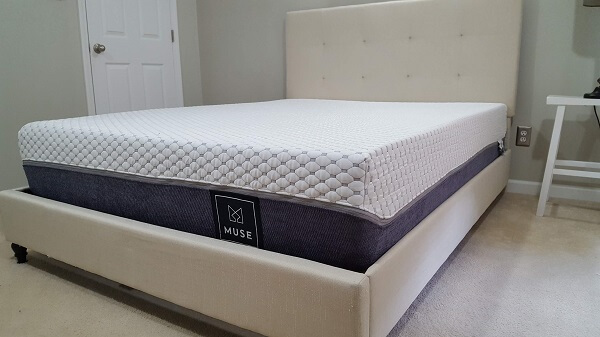 Muse does an excellent job separating itself from the crowd by offering a 12″ thick foam mattress with a unique combination of cooling gel foam and a washable cold wire cover which helps to keep you cool and dry at night. Also, offering three firmness options is a differentiating feature that is often not found with most foam mattresses. The majority come in a medium firmness which works well for most people but not all. Muse gives you two additional choices. Overall the Muse mattress performed well in all tests that I put it through and is reasonably priced. Morphiis Mattress Review – Is This Bed A Game Changer? WinkBed Hybrid Mattress Review – Is Just Another Mattress? Molecule Mattress Review – Is It Really Any Different? Next post: Molecule Mattress Review – Is It Really Any Different?